Siri’s wifi search has a strong preference for coffee shops, which is generally fine since coffee shops tend to be fairly comfortable and accustomed to people plopping down for a while with a laptop. 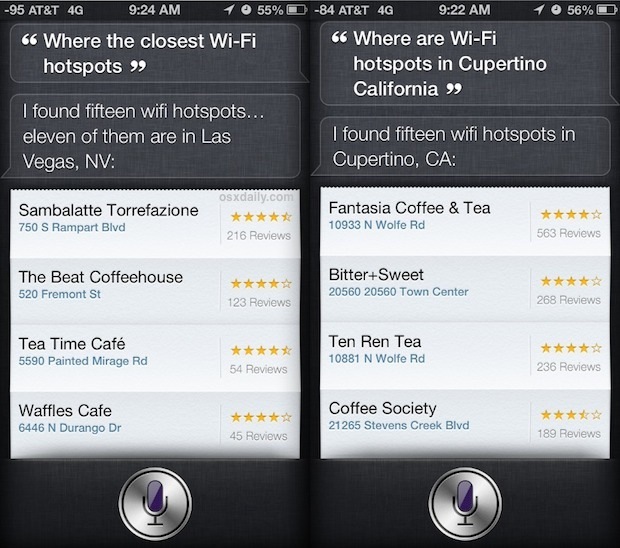 For those who don’t like working in coffee shops and cafes, you can also ask Siri to find nearby public libraries. Virtually all public libraries have free wi-fi to connect to, and they also tend to be much quieter than an average cafe hotspot. Note that Siri will sometimes find university libraries as well, and those typically require a university login to use making them inaccessible to the public. This is an excellent trick for anyone who telecommutes, travels, or just needs to get online while out on the road. Don’t forget that iPhones can also create their own Wi-Fi hotspot on the fly, though most carriers charge extra for the service and it quickly eats into your standard data usage as well if you’re not careful. the irony being if you’re looking for a wifi hotspot when your 3G/4G data connection isn’t working, you won’t be able to ask siri anything. if you want an offline database of wifi hotspots, i recommend the jiwire wi-fi finder app.